Don't let those cartoonish eyes and the stereotypically upbeat commercial for this juicer fool you. At its core, the Gurefuru Chuchu is a cold-hearted pulp shredding machine that turns any citrus fruit into a glass of fresh pulpy juice. 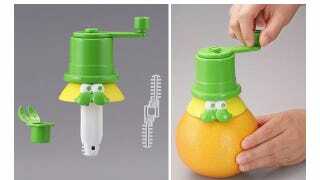 An included tool cuts a small hole in the peel which makes it easier to insert the juicer. While a set of pop-up arms work like tiny chainsaws, spinning as you crank the handle, turning the fruit's guts into an extra-chunky style slurry that can be sucked up through a straw.